300 Aluminum Slide Series. Specifically designed and installed as a flat bottom mount device, the high load carry ability of this slide will meet a wide range of applications in a compact footprint. This series can be mounted as a single slide or in multiple groupings to provide an extremely high load carry factor. With unique multiple angular ball races, the ultimate applied loads are spread out within the slide profile to ensure positive performance. Slide load ratings are suggested to a single flat mounted slide that can be multiplied by the number of slides installed. 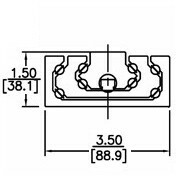 If this 300 series is mounted as a vertical bottom mount, the suggested load rating are doubled. When mounted flat the slide height is 1.50 inch / 38 mm and width is 3.50 inch / 89 mm. This series is a 3 member, full extension, ball bearing slide. The 300 series when mounted as a flat under / bottom mount, has the slide height of 1.50 inch / 38 mm and width is 3.50 inch / 89 mm. The 300 series is a 3-piece full extension device. This series of slides is ideal for applications such as military electronics, power supplies, cabinet enclosure / banks of enclosure pull out, trays, platforms, fire truck standing platforms, and medical MRI / Cat Scan units. 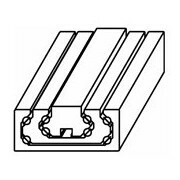 In certain applications this series can be mounted as a top slide to act as a hanging method in conjunction with or without lower load carrying slides.